The Mobile Suit Gundam franchise is turning 40 years old next year. And, as should be expected of a series celebrating such a milestone, Sunrise has quite a few projects in the works(Sadly, none of them appear to be a 0079 remake.). Just how soon some of these will see the light of the day remains to be seen, but at we know what they are(mostly), and that they will be available for our viewing pleasure eventually. I’m doing this because there are so many projects that it may not be easy to keep track of them all given Sunrise’s radio silence since announcing them. So let’s start this. As odd a name as “Narrative” is, the production values look on par with Gundam Thunderbolt and Twilight Axis. In terms of the narrative, the series takes place in U.C. 0097, one year after Gundam Unicorn and around the same time as Twilight Axis. 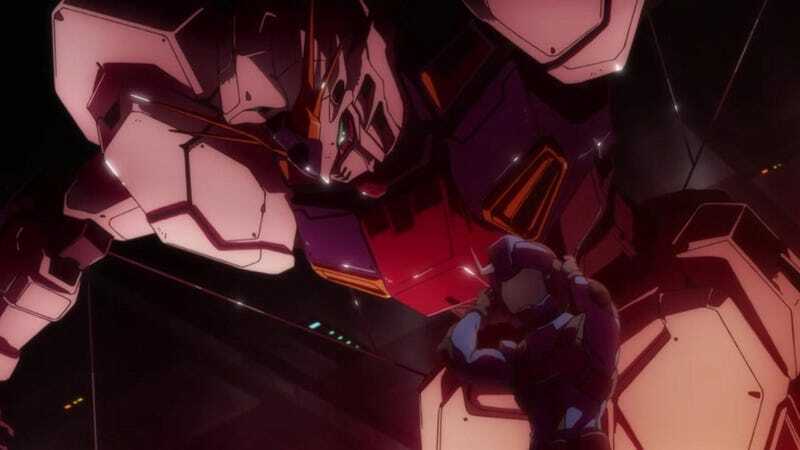 The trailer shows us the Unicorn Gundam Unit 03, also known as Phenex, a mobile suit originally introduced in a short called “One of Seventy Two.” Gundam NT will also feature the prototype version of the Nu Gundam featured in Gundam: Char’s Counterattack. Since it’s already gotten a trailer, it’s safe to assume that Gundam NT will be the first to air. It’s listed as a film project and is set for a theatrical run in November of this year. Back in April, around the same time that Gundam NT was revealed, Sunrise also lifted the veil on a very unexpected project: A sequel to Gundam 00. While story details are light, we do know that Graham Aker is back from the dead thanks to the ELS and a new Tieria-type Innovade has joined Celestial Being. Fittingly, Graham Aker finally gets to pilot a Gundam, the Exia Repair IV. The man himself, Setsuna F. Seiei, will likely have semblance of a role in the story. As for the format of this sequel, that has yet to be divulged. Since there’s plenty of artwork to go around, it’s safe to assume that this is indeed an anime project of some kind, but whether it’s a film, an OVA series, or a full-fledged TV series is currently unknown. Announced shortly after Gundam Narrative, the Hathaway’s Flash story will reportedly be receiving an anime adaptation in Fall 2019 or later, specifically a film trilogy. The story follows Hathaway Noa, son of Captain Bright Noa from the original Mobile Suit Gundam and it’s sequels. Hathaway himself had a role in the film Char’s Counterattack, which is set a decade before this story. On the same presentation slide that revealed the Hathaway’s Flash adaptation, there was a curious mention of a “UC2" set in the year U.C. 104. It’s scheduled release date was listed as 2022 and its format was simply labeled as “oversea’s drama.” What that means is anyone’s guess. The title “UC2" suggests that it could be a Unicorn sequel as “UC” was the abbreviation for the series. It’s also the initials of the Universal Century timeline. However, the “2" in the name suggests that that likely isn’t what it’s referring too. The best guess is that when it says “oversea’s drama” it’s referring to the recently announced live action Hollywood Gundam film, however I have a hard time believing they’d make a live action sequel to Unicorn which leads me to believe that “UC2" is not the live action film, but some other project, possibly a stage play. At the beginning of last month at Anime Expo 2018, Sunrise and Legendary Pictures announced a partnership to produce a live action Mobile Suit Gundam film. Contrary to media reports, this is NOT the first live action Gundam film, that honor belongs to G-Saviour from 2000. Currently, the plot of the film is unknown and no release year was given. Over the last decade, Gundam has seen its fair share of duds and successes. Gundam: Reconguista in G and Gundam AGE were duds. Gundam Build Fighters, Gundam: The Origin, and Gundam Thunderbolt were successes. Build Fighters Try was 50/50 and Twilight Axis was a dud. Iron-Blooded Orphans was a success and spawned a second season, which received a far more mixed reception but overall wasn’t bad. And now it seems that Sunrise is ready to dive back into the Post Disaster timeline. Earlier in July this image of a Gundam Frame was leaked. Originally, it was believed that it was teasing a new model kit of some kind. After all, most of the 72 Gundam Frames weren’t shown in the anime, with some being revealed in a spin-off manga series and others just being unveiled as gunpla kits. However, it was recently announced the Iron-Blooded Orphans anime will be receiving a continuation. This raises some interesting questions. The end of the second series was very definitive, meaning a continuation in the normal sense, at least with the same protagonist, is out of the question. But the epilogue left little room for any sort of major conflict to crop up in the future. It is entirely possible that by “continuation” they simply mean a new IBO project in general. In which case, the natural next step, to me and many others, would be to wind the clock back 325 years to the Calamity War and properly reveal the origins of the 72 Gundam Frames and their Mobile Armor adversaries that left the solar system in shambles.